John Greenleaf Whittier (17 December 1807 – 7 September 1892) was an American Quaker poet and abolitionist. Where pity dwells, the peace of God is there. Their right(colored Americans), like that of their white fellow-citizens, dates back to the dread arbitrament of war. Their bones whiten every stricken field of the Revolution; their feet tracked with blood the snows of Jersey; their toil built up every fortification south of the Potomac; they shared the famine and nakedness of Valley Forge, and the pestilential horrors of the old Jersey prison ship. Barbara Frietchie (1863); reported in Diane Ravitch, The American Reader: words that moved a nation (2000), p. 259. 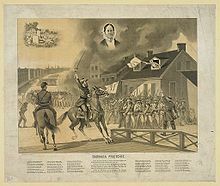 The lines are based on an folkloric account of the real Barbara Fritchie, said to have made a similar challenge to Confederate invaders of Maryland during the American Civil War. But spare his "Highland Mary!" Perish with him the folly that seeks through evil good. The dread of all who wrong. Better heresy of doctrine than heresy of heart. Each crisis brings its word and deed. Sung, painted, wrought, lies close at home. The Armageddon of the race. Who never climbs as rarely falls. And drink the poppies of Cathay. Were the truths of long ago. My Birthday'', reported in Bartlett's Familiar Quotations, 10th ed. (1919). Compare Browning, Pippa Passes. When he hummed in court an old love-tune. Saying only, "It might have been". Weary lawyers with endless tongues. And what is dark below is light in heaven. Who lean, like John, upon His breast. This page was last edited on 4 January 2018, at 14:27.